Independent percussionist, drummer, composer and music producer based in Stockholm, Sweden. 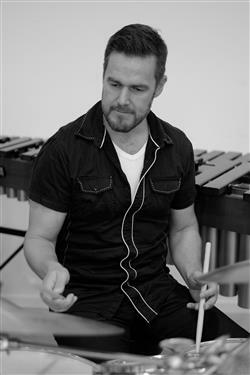 Director of Percussion Studies at the Ingesund School of Music at Karlstad University. Rolf received his Masters Degree at Piteå School of Music at Luleå University as a student of Anders Åstrand. Right after finishing his studies he became a founding member of the percussion group Global Percussion Network (GPN) together with Anders Åstrand and Daniel Saur. GPN has toured and performed around Europe, Asia, South- and North America. Between 2006-2015 Rolf held the position as principal percussion and solo field drummer in the Swedish Army Band. As a military musiscian Rolf travelled and performed in Sweden, Norway, Denmark, Germany, Schwitzerland, France, Afghanistan and Kosovo. Since 2001 Rolf is a member of Ensemble Villancio. This ensemble has toured more than thirty countries with its Early World Music repertoire - foremost Latin American baroque music and early music. Besides performing and teaching Rolf is also composing and producing music on his own label. 2 CD:s will be released during 2017 with completely new music.